So this Christmas season, we are not just celebrating a baby in a manger….we are celebrating the resurrected Lord Jesus Christ. Whose myriad of names hold such significance, hope and meaning for us as we find in Him the fulfilment of their promises. This is why we have chosen the theme “His name shall be” over this season. We want people to see Jesus. There are many opportunities to invite people to come and encounter Jesus. Starting from this Sunday, so do consider who you might invite to come along! Thank you so much to those that came last Saturday to help us decorate the tent and barn! They are both looking amazing, ready for our Christmas services! 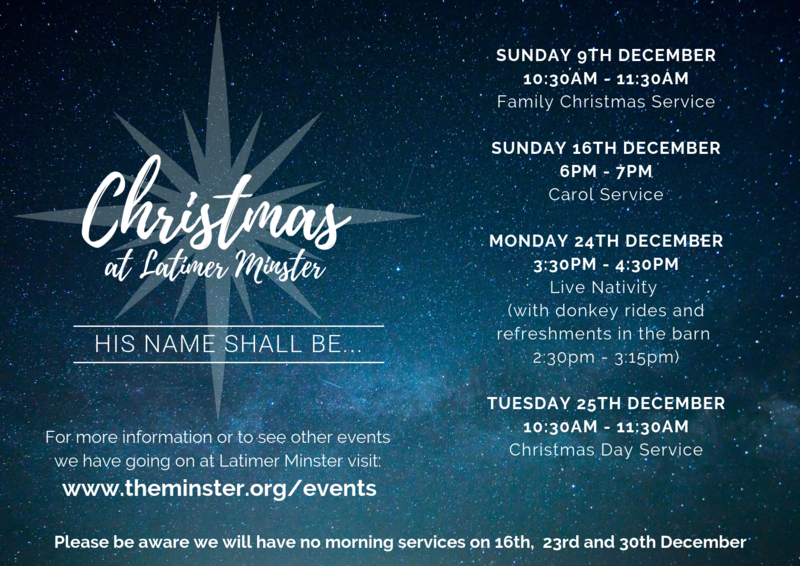 Join us this Sunday where the children will be staying in the service and we will be having special performances, festive treats for the children and donkey rides after the service! Please be aware we will have no Sunday morning services on 16th, 23rd & 30th December. One Can Trust (a foodbank in High Wycombe) are doing a Christmas Countdown Calendar. Starting from 1st December they are asking people to put a needed item or a pound coin each day in a bag for life and then drop off their collected items at their foodbank in High Wycombe by mid December. Click here to find out more information and see the drop off days and a list of needed items. If you would like to collect for the Calendar but are not able to make it to any of the drop off days then either contact One Can Trust here or speak to Rebecca.